New name, same reliable solar protection. Providing solar protection for over 25 years, Soltis Proof 502 is a premium awning fabric collection from Serge Ferrari. Visually appealing and high performing, it features a satin finish and double-sided PVDF coating. Serge Ferrari's Précontraint process gives the shade fabric excellent dimensional stability. Made of high-tenacity polyester, the coated material defends against weather, UV rays, and dirt, making maintenance carefree. Soltis Proof 502 is waterproof, mildew-repellent, heat-sealable, and printable. Available in dozens of colors and backed by a 10-year warranty. Part of what lends to the fabric’s popularity is its versatility. 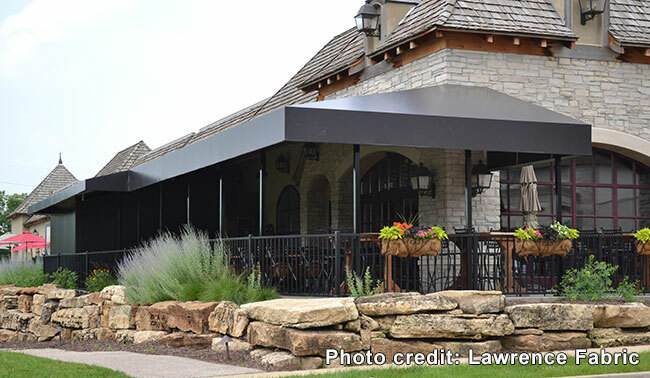 Soltis Proof 502 can be used in fixed frame and retractable awnings, canopies, solar shade sails, light shade structures, patio pergolas, tents, and more. The wide width allows for extended coverage in any setting. For details on more Serge Ferrari collections or fabrics, check out our Serge Ferrari page. Or for a quick overview of their recent rebrand and new product line names, refer to our Serge Ferrari rebranding information page.